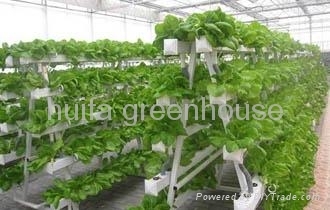 ~Hydroponics is a subset of hydroculture and is a method of growing plants using mineral nutrient solutions, in water, without soil. 1. High yield, double output than plant with soil. 2. Saving labor, saving water and fertilizer, high quality and efficiency, environmental protection, pollution and avoid continuous cropping obstacles and so on. 3. Save the fertilizer 80 % .and Save the water 85 %. 4. Save the pesticide, friendly of the environment . 5. High quality and more safety. 6. All the growing conditions can be controlled.